Photo of a concrete foundation by craft room/Flickr. If you’re working on an addition to your home, you’ll be connecting a new foundation to an old one, unless someone just happened to set up an extra foundation while building your house for your future convenience. This might seem like an intimidating task, because we tend to think of foundations as very solid things that can’t be changed Actually, though, they’re just supportive structures, like the beams that hold up your walls and roofs, and you can tie things to them ... as long as it’s done with care. Be aware that in many regions, modifications like additions must be designed by an architect or engineer, approved by a planning department, and permitted. This is especially important if you live in a seismically active area where poor planning could have catastrophic results during an earthquake. Check with your remodeling contractor and the local building department to find out what you need to do before you start. 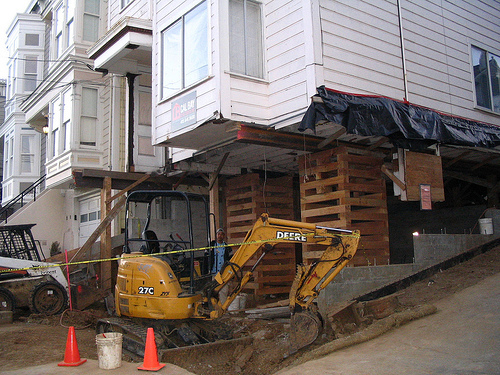 The first step in connecting a new foundation to an old one is site preparation. Foundations depend on the soil beneath them, and the soil under the new foundation will need to be as similar as possible to that under the existing one. The soil can be dug out and compacted, and measures like adding fill may be necessary. If the soil is in poor condition, deep footings or piers may need to be sunk into it to provide as much stability as possible, ensuring that the new foundation will be less prone to shifting, settling, and drift over time. With the site prepared, the foundation can be laid out. Several connection options are available to join the new and old foundations so they’ll flow seamlessly together in the finished project. They can include attaching to metal bars and other components left in place by a construction crew during the original pouring, as well as installing new structural steel bars, braces, or similar components. These anchors serve to unite the foundations, although your new foundation will still be pulling its own weight, so to speak, with a design -- a perimeter, slab, or pier -- that evenly distributes weight across the underlying substrate. Once connected, sealants can be used to make the join waterproof so problems don’t develop in the future. If your new foundation starts cracking, splitting, or showing other signs of wear, these indicate that it was installed improperly. Some potential reasons for such problems can include poor soil preparation, structural steel not graded for this application, or concrete that doesn’t meet building standards. Be sure that you have a contract with your builder that clearly spells out the construction method and materials to be used, along with the recourse available in the event of a failure related to a builder’s mistake. Depending on the size and type of an addition, some specialty engineering may be involved. This can also be true of additions that will be going in at different heights than the main house. It is a good idea to bring an engineer into a project as early in the planning stages as possible, as engineers can help determine which parts of a home site are the best candidates for an addition, and they can assist architects with the development of a structurally sound and safe building plan.